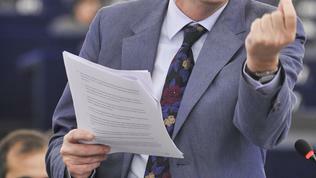 Where Is the European Parliament in Your Decisions? 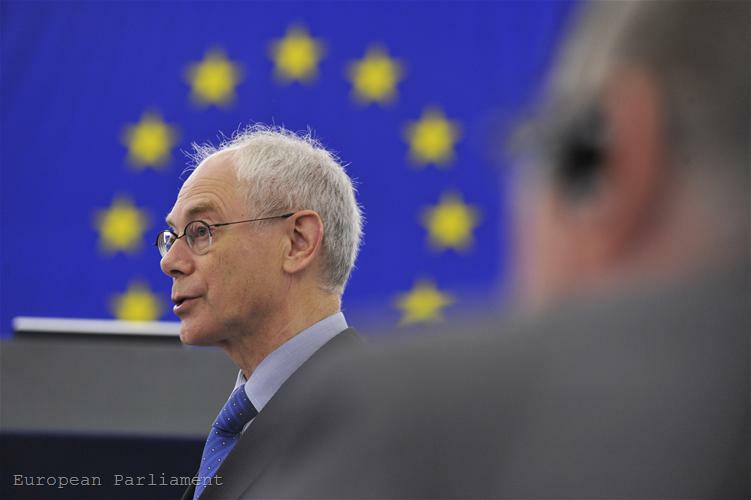 After only a few hours of sleep European Commission President Jose Manuel Barroso and European Council President Herman Van Rompuy appeared before the MEPs in Strasbourg to inform them about the decisions eurozone leaders took on Wednesday night last week. 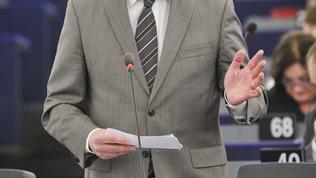 The two leaders were welcomed in the house of the European Parliament in Strasbourg with applause by the attending members, and the president of the European Parliament, the Pole Jerzy Buzek, after thanking them for appearing only 6 hours after the end of the summit, said that the euro area was not a derogation of the European Union. "I myself will do my utmost to avoid the division of Europe". Mr Buzek's introduction, entirely in synchronous with the position of the Polish EU Presidency, expressed by Polish PM Donald Tusk, did not express what the presidents of political groups said during the debate. 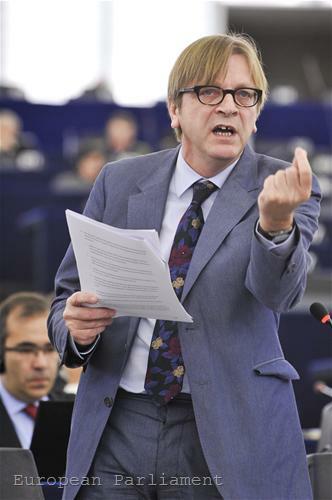 And their main message was - where is the European Parliament in your decisions? In their decisions euro area leaders have outlined several measures with which to strengthen the governance of the monetary union. The specific measures are enlisted in a special annex and are ten. The European Parliament's role is mentioned in point 3 and gives the only European institutions whose members are being elected directly in the European Union the right to be informed about the results of eurozone summits post factum. As euinside wrote, the leaders foresee holding regular euro area summits at least two times a year with the European Commission president also attending. At these summits will be outlined the strategic guidelines for the economic policies and for improving competitiveness and strengthening of the economic convergence in the euro area. 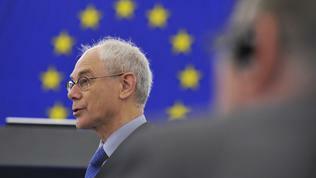 The euro summits president, who for now will be Herman Van Rompuy until a permanent president is elected, will be responsible for the preparatory work of the summits in close cooperation with the Commission. "The President of the Euro Summit will keep the non euro area Member States closely informed of the preparation and outcome of the Summits. The President will also inform the European Parliament of the outcome of the Euro Summits", is stipulated in the conclusions. The European Parliament will not even be consulted when discussing various options what limited Treaty changes will be made in order to achieve additional strengthening of the economic governance of the eurozone. The leaders have assigned this task to the president of the European Council in close cooperation with the president of the Commission and the leader of the Eurogroup (the ministers of finance of the eurozone). 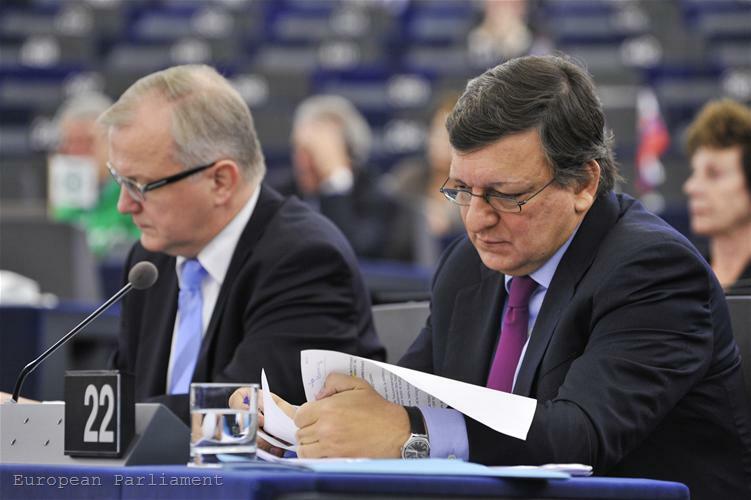 In his statement before the MEPs, however, Jose Manuel Barroso assured that the European Parliament had to be entirely involved in those major changes. The Parliament is mentioned one more time in the conclusions, where the leaders' expectation is expressed for the forthcoming proposal of the Commission to the Council and Parliament, according to article 136 of the Treaty of the Functioning of the EU. This article was introduced via similar limited Treaty changes a year ago, aimed at allowing strengthening of the economic governance of the eurozone. It also envisages enhanced coordination and surveillance over the budget discipline of the euro area member states; development of guidelines for economic policies. 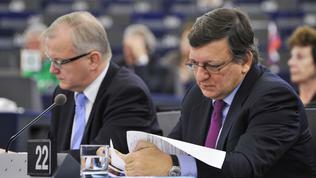 Although in his speech before the MEPs President Barroso said that precisely from this point of view it would depend on Parliament and Council, who will take a joint decision, how fiscal surveillance would be increased, most of the MEPs who spoke reacted sharply against the evasion of Parliament in the decision-making process on so important and even crucial decisions. 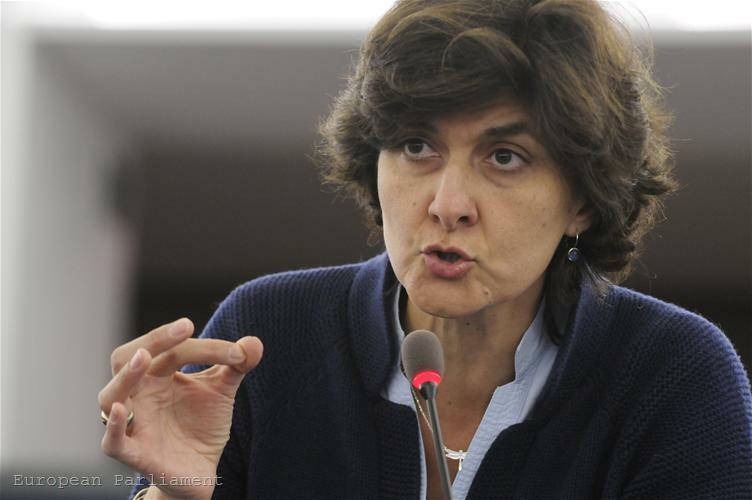 Most critical was Sylvie Goulard (Alliance of Liberals and Democrats for Europe, France) who was one of the main rapporteurs of the special crisis committee on one of the six proposals for reform of the economic governance (budget surveillance). According to her, the European Parliament has to be the place for exercising pressure in a democratic way because there is no way this to happen in the Council (the member states). She expressed her respect for the Bundestag but said that the summits could not be dependent on the decisions of German deputies. Ms Goulard has in mind the hearing in the Bundestag of German Chancellor Angela Merkel literally hours before the summit. By the way, these hearings in the already famous in the media as "mighty" budget committee are mandatory, according to the decision of the German Constitutional Court on Germany's role in the rescue operations of the eurozone. The government has to ask for a preliminary approval the budget committee in the Bundestag before deciding on Germany's participation. Rebecca Harms, co-president of the group of the Greens and the European Free Alliance (Germany) also expressed disappointment with Parliament being ignored but focused on something else. According to her, the eurozone summits are not transparent, there is no democracy with them and should not continue like this. Ms Harms agreed that more powers were necessary for EU Commissioner on monetary affairs Olli Rehn, who the same day was promoted to the post vice president of the Commission with increased powers, as was envisaged in the conclusions of the eurozone leaders of October 26. 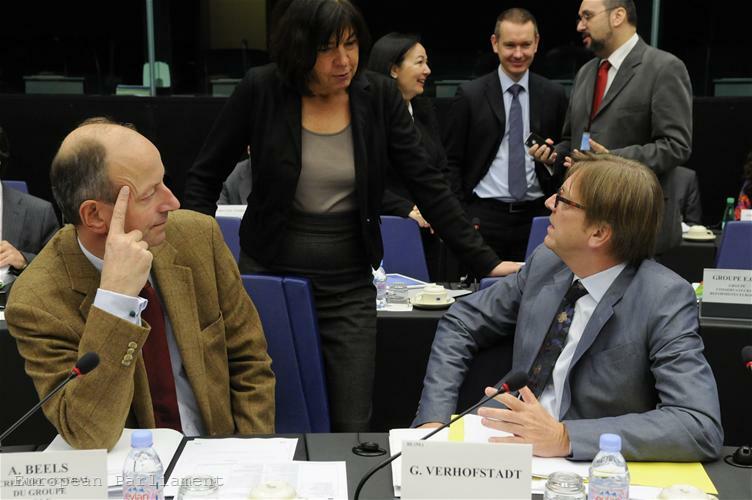 As usually, most vehement in his criticism was ALDE leader Guy Verhofstadt (Belgium), according to whom there could not be a real governance of the eurozone with only two summits a year. He recalled the times when he was a prime minister of Belgium and stressed that governance required meetings at least twice a week and if necessary twice a day. 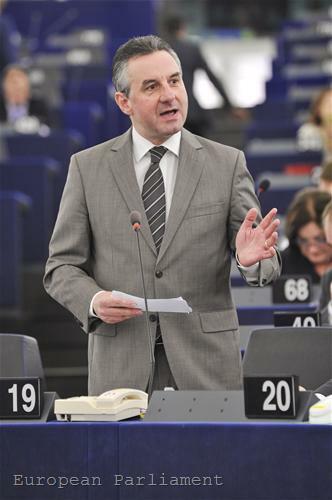 According to Jan Zahradil (European Conservatives and Reformists, the Czech Republic), the decisions of the leaders are leading toward creation of a transfer union, which will be too expensive for the EU. 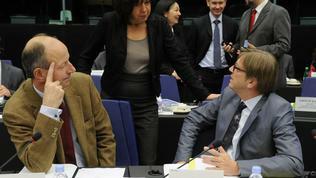 He was among the MEPs who reacted sharply to the risk of isolation of the non-eurozone member states. His focus was, however, different. In his words, the non-euro countries should be allowed to again decide on whether they want membership or not because in their accession treaties a mandatory membership is stipulated after the criteria are fulfilled. 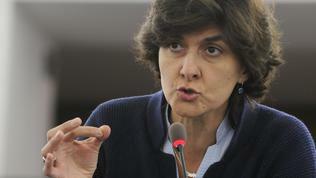 "We have signed in our treaty membership in the eurozone not a membership in a bond or transfer union", Zahradil said. In the Czech Republic debates are going on holding a referendum on the republic's membership to the euro area. "Did you forget the lessons of the Lisbon Treaty", the Czech asked and concluded with the words that the simple shifting of chairs on the deck of Titanic was not a solution. As could have been expected, the president of the largest group, the European People's Party, Joseph Daul (France), praised the achieved outcome, but stressed: "We are all Europeans - those outside the euro area and those inside. But we have obligations and rights. First are those 17 [countries from the eurozone]", which is in harmony with the position of French President Nicolas Sarkozy that the non-euro countries may be interested in what is going on with the monetary union but the decisions must remain for the countries of the euro area. Regarding the envisaged Treaty changes Mr Daul emphasised that whatever they might be it must be clear that "we have no time to wait for 10 year to change the treaties". He means the time that the creation of the Lisbon Treaty took. Most of the MEPs, who spoke, expressed scepticism regarding the decisions aimed at ending the crisis, most of all regarding the volume of the rescue fund EFSF to one trillion euro, given that were discussed sums between 1.5 and 2 trillion. In general, in spite of the criticism, the feeling during the debate was of relief that after all a solution had been found, no matter that again it meant buying more time.